Can you believe it? Surfaces is here! Here at Emily Morrow Home, we’ve been busy putting the finishing touches on our beautiful new hardwood products and our theme this year is “Design Journey.” If you find yourself in Las Vegas this coming week, please plan to come visit us in Booth #925 at Surfaces 2019! You won’t be disappointed in our gorgeous new products, unmatched craftsmanship and designer-inspired color palette. Also, we’re very proud to announce that Emily Morrow Home is nominated for three Floor Covering Weekly Dealers’ Choice Awards. Visit our Campaign Page for more information on how to post to our selfie “Snap and Give” campaign. For every selfie submitted Emily Morrow Home will be making a $3 donation to the Floor Covering Industry Foundation. To find out more about what FCIF is doing for those in the flooring industry click here. 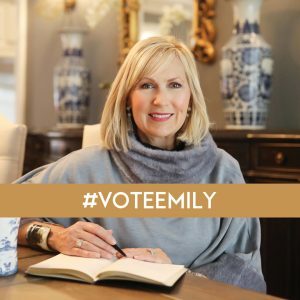 Please #VoteEmily!